Colorful bolts of fabric vied with the whir of multiple sewing machines for our attention as we stepped out of the heat and dust and into the small blue building. She was eyeing my daughter’s Solly baby wrap, a massive length of fabric that was wrapped around her body and holding my infant grandson safe and snug against her chest. Guerline had never seen one, and her excitement was palpable. We could understand why: this beautiful young seamstress stitches colorful bags and wallets with just one arm. She lost the other one in the 2010 Haiti earthquake. We joined her in the dream of keeping her someday-baby close while being able to continue working, all of us recognizing that her job is a luxury and blessing in poverty-stricken Haiti—especially for someone who is disabled. Guerline is one of 25 employees at Three Cords Haiti, a successful small business on the campus of Mission of Hope Haiti (MOH), a large nonprofit organization that provides food, housing, faith strengthening, education, and job training to a large region of the country. The employees at Three Cords are disabled and at-risk women who have risen above their circumstances of missing limbs, deafness, and extreme poverty. They joyfully produce colorful and expertly sewn fabric purses, totes, wallets, pocket T-shirts, and hair accessories. 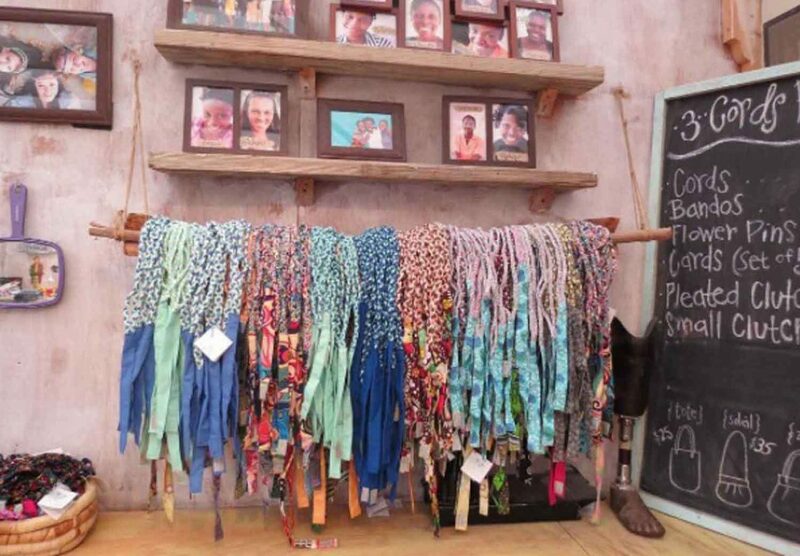 The items are sold online, through trunk shows, by some North American retailers, and in the Mission of Hope on-campus store, where they are scooped up by the more than 5,000 North Americans who do mission trips there each year. The profits from Three Cords fund a prosthetics lab on campus, which was responsible for fitting thousands of Haitians with arms, legs, and feet in the aftermath of the earthquake. Now, the prosthetics center keeps those patients—many of them children—in properly sized feet and legs as they grow and age. …this beautiful young seamstress stitches colorful bags and wallets with just one arm. Three Cords was started as a result of the earthquake. At the time, Mission of Hope had a small medical clinic and the region’s only ambulance. It set up a makeshift surgery center and hospital to tend to the many people injured in the quake. A missionary who came to help decided to teach the women waiting for surgery, and in recovery afterward, how to braid fabric into woven headbands. Knowing those women would need opportunities to grow and work, the idea behind Three Cords was formed. In September 2010, Three Cords was launched and quickly expanded to hire from a nearby deaf community. Today, most of the artisans on staff are women with a disability, and Mission of Hope continues to look for ways to provide employment opportunities for the disabled as it pursues its vision to bring life transformation to every man, woman, and child in Haiti. Guerline grew up in Port-au-Prince with a large family of seven brothers and seven sisters. She lost her arm during the earthquake when a wall fell upon her. Life was extremely difficult for her afterward, as she was forced to relearn basic tasks such as buttoning her shirt or doing her hair. In addition, amputee victims are often viewed as outcasts in Haitian culture, so lacking her arm led to much ridicule from others. Guerline came to Three Cords in 2013 when she heard of the work opportunity provided to those who are disabled. Although she could not use a sewing machine to sew products like the others, she taught herself how to hand-stitch outer edges of Three Cords wallets using her good arm to stabilize the product and her teeth to pull the stiches through. She also uses this method to make Christmas ornaments. The MOH prosthetics lab only specializes in lower limbs, and the last time I saw Guerline, she was joyfully working at her desk with her one arm. But shortly after that, an American prosthetist who came to volunteer in the lab made a mold of her arm and took it with him back to New York. He returned a few months later with a new prosthetic arm for Guerline; she was overjoyed and remains that way every day. Gernise has been with Three Cords since the beginning. She grew up in a suburb of Port-au-Prince, graduated high school, and went on to study nursing at a university in the city. When the earthquake hit, Gernise was attending class. With the force of the trembling, the walls of her school collapsed on her and she was stuck under the rubble, calling for help throughout the night. By the grace of God, Gernise was found alive and rescued the next day. Although she survived, her leg was severely injured and amputated. Soun-Love grew up in Port-au-Prince in a large family of 12 with nine siblings and her parents. At 14, she began working as an artisan at a company called Gadesa IndepCo. There, she hand-beaded dresses and bags as well as created paintings. When the earthquake hit, Soun-Love was on the second story of her house in Port-au-Prince. As the ground split, her home split beneath her as well, and she fell through the crevice of the second story floor. Soun-Love says she remembers reaching up with her hand, but no one was there to help her. The fall wounded Soun-Love’s knee and the bottom half of her calf was amputated. In addition, Soun-Love’s father died along with several cousins, her mom was paralyzed, and her sister’s head was greatly injured. While hospitalized, she met a woman from Israel who took her there to get a prosthetic leg. When she returned, she began working at Three Cords. She is a quiet soul who loves working with other people who have experienced the same struggles and are able to understand her pain. Soun-Love now lives in a nearby village with her husband and her two small children. Sophonie is one of Three Cords new deaf employees. She lives in the village of Leveque, where there are 168 deaf families. Sophonie attended a sewing class in Port-au-Prince that gave her a basic knowledge of sewing before she came to work for MOH. She just graduated from the Haiti Deaf Academy in January. She was married last July to a deaf pastor who works for Mission of Hope, and they are expecting their first child, a little girl, in May. Stephania is the youngest employee at Three Cords, one of the Village of Hope girls and looked upon by the other employees as their “little sister.” She has a gift for seeing a picture of a bag or an article of clothing and being able to replicate it with lightening speed. Stephania works at Three Cords in the morning and attends high school in the afternoon. When she graduates, she wants to attend medical school. Stephania knows some English, so she also serves as a faithful and patient Creole teacher to Courtney Johnson, a young woman from Iowa who lives at Mission of Hope and oversees the work at Three Cords and the running of the market. Every time I visit Mission of Hope I try to get down the hill to Three Cords to see what the women are creating. We speak a different language with our mouths, but I hope they see in my eyes the respect I have for their courage and perseverance. They know and love my daughter and my grandson, so I get hugs from many of them just for being their mama and nana, and I treasure those. I cannot fathom the agony of the 2010 earthquake, the losses of limbs and family and friends that they endured. To have moved beyond that to develop a career and earn a paycheck is truly remarkable given the hardships of high unemployment and discrimination they face in Haiti. They are kind, humble and inspirational women who display grit and grace in great measure. Anyone interested in learning more about Three Cords or purchasing items online, can visit www.threecordshaiti.com or follow on Instagram. Anyone interested in visiting Mission of Hope can learn more at www.mohhaiti.org.